Mix the salt & cabbage in a bowl & set aside for ½ an hour to remove excess moisture from the cabbage. Drain out the water & rinse the cabbage with cold water twice. Now squeeze the cabbage in a muslin cloth to remove the remaining moisture and put in a bowl. Mix in all the other ingredients, chill & serve. Kimchi is an important Foodstuff of Korean cuisine. It’s one type of salad or pickle. 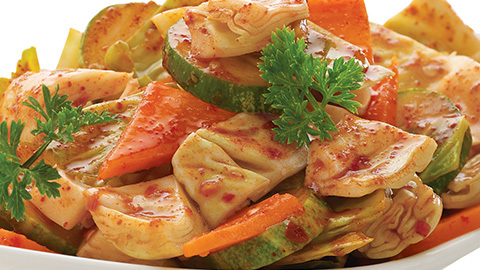 It’s a Healthy Kimchi Recipe and consume in every main meal course. 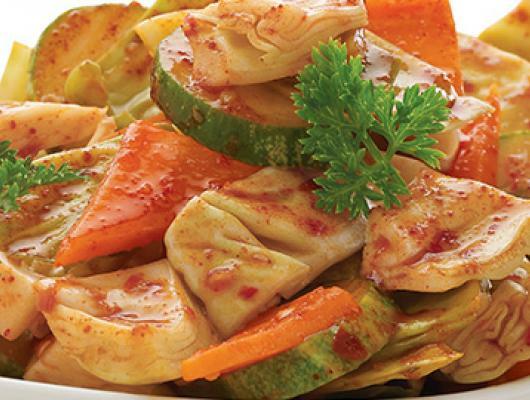 Kimchi is made of the verity of Vegetable and the main Vegetable is Korean cabbage. It is a delicious and tasty salad Kimchi recipe. Desi Chinese Healthy Salad Kimchi Recipe.